Balangir (Odisha) Jan 15 (PTI): Prime Minister Narendra Modi Tuesday launched a slew of central Government projects worth over Rs 1,550 crore in Odisha and said they would play a key role in accelerating the state’s development. Affirming the Centre’s resolve to expand connectivity in Odisha, he said education, coupled with connectivity, would lead to speedy development and overall progress of all sections of the society. “I am happy to unveil projects worth Rs 1,550 crore in areas like education, connectivity, tourism and culture,” Modi said while inaugurating and laying foundation stone for a series of projects, mainly in the railway sector, at a function here. During his third visit to Odisha in as many weeks, the prime minister dedicated to the nation the electrification of Jharsuguda-Vizianagaram and Sambalpur-Angul railway lines spanning 813 km, which have been completed at a cost of Rs 1,085 crore. The project aims to ensure seamless rail connectivity on the line and reduce journey time. It will also reduce diesel consumption and greenhouse gas emission, a senior railway official said. Modi also inaugurated the doubling of 14.2 km Barpali-Dungaripali and 17.3 km Balangir-Deogaon rail lines, completed at a cost of Rs 189.3 crore. They are part of the 181.54 km Sambalpur-Titlagarh doubling project. Describing connectivity as a catalyst for progress, Modi said it would boost trade, commerce and tourism, besides helping farmers in taking their produce to the mandis. Strong connectivity would also propel industrialisation, which in turn would create enormous opportunities for employment generation, he said. A Multi-Modal Logistics Park (MMLP) at Jharsuguda, built at a cost of Rs 100 crore, was dedicated to the nation by the prime minister. Spread over 28.3 acres, the MMLP is adjacent to the Howrah-Mumbai main line, 5 km from Jharsuguda Railway station. Several industries, such as cement, paper, aluminium, refractory, pig iron, sponge iron and steel pipe, located in and around the area would benefit from the facility, Modi said. He also inaugurated the 15-km-long Balangir-Bichhupali railway line laid at a cost of Rs 115 crore. It is part of the new 289-km Balangir-Khurda Road line which connects to Howrah-Chennai main line on Khurda roadside and Titlagarh-Sambalpur line at Balangir. The line would connect coastal Odisha with western region through Sonepur, Boudh, Puranakatak, Daspalla and Nayagarh, synchronising development across the state. The line would also benefit many micro, small and medium enterprises and cottage industries, and generate opportunities for the mining sector. The prime minister flagged off a new train on Balangir-Bichhupali route which would benefit commuters of the region, besides connecting Bichhupali to Jharsuguda and Vizianagaram main line through Balangir. A bridge between Theruvali and Singapur Road station, constructed at a cost of Rs 27.4 crore, was inaugurated on the occasion. The bridge reestablishes the linkage over Nagavali river, which was washed away during floods in July 2017. Bhubaneswar: The Odisha cabinet on Friday approved Tata Projects Limited’s bid to construct the 100-seated medical college at Bhawanipatna in Kalahandi district. Tender for the construction work was floated with an estimated cost of Rs 202.39 crore in which three bidders– NCC Limited, Shapoorji Pallorji and Company Private Limited and Tata Projects Limited– were found technically qualified. Among the three, Tata Projects Limited stood lowest with a bid value of Rs 2,20,73,98,218, official sources said. The construction work will be completed in two years of time without any price escalation. The Odisha government has taken a gigantic step to improve the medical education in the state to cater to the needs of the qualified doctors to wide spread health institutions in the state. An important meeting was held here with the representatives of industries and mines organisations of the undivided Sambalpur district on Friday under the chairmanship of Northern Revenue Divisional Commissioner DV Swamy. As discussed, a super specialty hospital would be set up soon by the Neyveli Lignite Corporation (NLC) at Rengali of Sambalpur district. It was also decided to complete the proposed diagnostic centres at the Jharsuguda District Headquarters Hospital and Laikera by the Vedanta Aluminium Company and a mega stadium under construction with MCL fund by the end of December. On Thursday, a meeting was also held relating to the Assembly constituencies of Jharsuguda and Rengali. The industries were requested to fulfil their social responsibilities towards common problems of the two constituencies. Participating in the discussion, OPCC working president and Jharsuguda MLA Naba Kishore Das said industries should work sincerely to remove the drinking water problems by removing earth and weeds from all the reservoirs besides its repair where necessary and digging of bore wells on a priority basis. Rengali MLA Ramesh Patua, Jharsuguda Collector Bibhuti Bhusan Patnaik, Sambalpur Collector Samarth Verma, Jharsuguda ADM Trilochan Majhi, Secretary to RDC Bibhuti Bhusan Behera along with representatives from Jharsuguda Vedanta Company, MCL, Neyveli Lignite Corporation, Aditya Birla, Hindalco, Aryan Ispat, TPSL, Seven Star and mines units attended the meeting. Bhubaneswar: The traditional handloom and textile designs of Odisha enjoy acceptability worldwide. Sambalpuri sarees are acclaimed by many for its distinctive patterns and beautiful motifs. Their producers, weavers behind the skill, are recognized and awarded. However, the weavers feel they need more than just awards and felicitations. They need patronage in terms of market, skill development training and economic support. We talked to a few award-winning weavers of Bargarh district to elicit what can boost their plight and creativity. Seventytwo year old Tribikram Meher of Mahalakanta village in Bheden block of Bargarh district is a national award recipient that he has bagged thanks to his innovation of some motifs in Sambalpuri handloom. Asked to tell about his work the weaver said, “I have created a number of motifs using different natural elements like flowers, sun, different plants etc. Even, I can create a new customized motif as per the need of a customer. However, we don’t get enough remuneration for a customized work and so stick to the existing one.” Tribikram and his wife live with the family of their son Sarat Meher, who also helps him in weaving along with his family members. The elder son has also inherited the traditional business of their family, but he shifted his base to Ulunda in Subarnapur village. “I have heard weavers are entitled to some kind of pensions. If my father could be given any such kind of pension in lieu of his creative works as a weaver, it would be a great help to our family,” the innocent villager added. 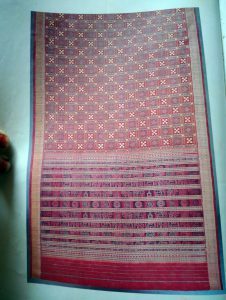 Sambalpuri saree is made from fabric woven on a hand-loom. Varieties of the Sambalpuri saree include Pasapali, Bomkai and Bapta saris, which are in high demand. Most of them have been named after their places of origin and are popularly known as Pata. “In Orissa market Pochampalli clothes from the southern states are available. The cloth resembles like Sambalpuri handwork. These clothes are made in handloom, not in power-loom and have most of the characteristics that our clothes have. I have also visited their work place. They use machines where bulk production is possible in less time. In their technology one person can do the work which will need at least two persons in our technology. However, since all our works are done manually we can produce only four pieces of clothes at one time. If our weavers will be financially assisted to buy such machines we can also produce more clothes in less time,” he added. Bhubaneswar: While Odisha may have registered a healthy 12.9 percent surplus rainfall this monsoon season, drought threat looms large over a significant portion of western Odisha. Bargarh, which is also known as the ‘Rice bowl of Odisha,’ along with areas of Sambalpur, Nuapada and Sundergarh have been badly affected by deficit rainfall this monsoon season. It is to be noted that this is the third consecutive year that western Odisha is facing a drought situation. In the beginning of the monsoon this year, farmers were quite optimistic after good spells of rain, however as the paddy crops began to ripen, rain subsided. The situation is quite severe in Sohela and Bijepur block of Bargarh, sources said. Farmer outfits have urged the government to take necessary steps to provide water pumps and pipe connection to sustain cultivation. In Nuapada district, after three consecutive seasons of drought-like condition, farmers had hoped that this year would be a silver lining. On the contrary rainfall was not as expected. The condition is no less grim in Sambalpur district where hundreds of farmers and other locals led by BJP MLA Rabi Naik stormed to the streets demanding drought-hit status for Kuchinda sub-division. Cultivators have warned that if the government does not take any proactive steps to mitigate the condition and provide adequate compensation, they would intensify their agitation. “If the government does not ensure quick disbursement of crop insurance and compensation, we will launch protests,” farmer leader, Vimal Joshi said. Meanwhile, the administration has assured to assist the farmers in tackling the situation. “We have already begun arrangements to provide diesel pump sets at subsidised prices. This apart, we are also providing water connection from canals and other water sources to affected farmlands at subsidised rates,” said deputy director of Agriculture department in Bargarh, Dinabandhu Gandhi. Ganda Baja is a prominent folk musical tradition of western Odisha. The players of this art form belong to the Ganda community (a Dalit community, largely from parts of western Odisha that border Jharkhand and Chhattisgarh). Generally, the Ganda are landless people mainly dependent on Ganda Baja and weaving for their livelihood. Since their traditional occupation of weaving has been failing with mill-made clothes flooding the market, they have been reduced to landless agricultural labourers. Some among them have also migrated to urban areas in search of livelihood. “Baja” is a collective of musical instruments, including membranophones (the dhol, nisan, and tasa or timkidi), an aerophone (muhuri), and an idiophone (jhumka). This Baja is traditionally played during marriages, childbirth ceremonies, idol immersion processions, some administrative occasions, funeral processions, etc. Each occasion’s music has a distinct beat and tenor. For example, the “Jhi Bahar Par” (music for daughter’s departure to her in-laws’ place) is played when a bride is escorted out of the village by friends and relatives as she leaves for her marital home. The “Dargad Par” is played when a wife wails and mourns her husband’s death. Songs are specifically learnt for the occasion. The composition of “Dargad Par” evokes fear and awe in the listener. The Ganda Baja is a way of living, a cultural manifestation of life in western Odisha. These days, the traditional genre has undergone tremendous change. A Ganda Baja troop consists of a minimum of five members in different capacities. They are Muhuria (the person who operates the muhuri), Dhulia (the person who operates the dhol), Taslia (the person who operates the tasa), Nisnia (the person who operates the nisan), and Jhumkia (the person who operates the jhumka). Five members is the minimum strength of the troop, but six members is considered a sound quorum for the group, with one dhol, one muhuri, one jhumka, one tasa and two nisan. The group has the flexibility of extending it to eight members, if there is a demand for dancers (a man in the outfit of a woman) from their clients. It is believed that a troop is stronger with a larger number of members in varying capacities. The members have learnt this art form from their forefathers, having travelled together and performed with them since childhood. Due to the stigma associated with the community and the practice of untouchability, they learn this art form from their family members as a livelihood skill. The members of the community mainly earn during the marriage season. Earlier, they used to perform for three to five days. Now, it has reduced to a maximum of two days. Earlier, the agreements between the patron and the Ganda Baja troop were through the jajmani system in these areas and were usually oral contracts. The wage rates offered to them were very low and they had to accept whatever amount was offered. Once they entered into an agreement, sometimes their patrons had exclusive and absolute rights over their services for a particular period of time (usually three or five days). For this stipulated time they were like bonded labourers. In some instances, the party engaging them would pressurise the troop to beat drums all night so they could drink and dance. Sometimes they would even have to walk for hours and cover long distances carrying heavy instruments to reach their destination. And, at times, they would have to wait for long hours for food, once they reached there. Things, however, are changing. Currently, a contract is completely based on mutual agreement. Slowly, the community is demanding market-negotiated wage rates. Income encompasses payments in both cash and kind. The minimum rate is ₹ 5,000 per performance, and the maximum is ₹ 15,000, shared by the members of the troop. They have around 30 performances for different occasions over seven to eight months in a year. Ganda Baja is still a major source of livelihood for this community in a large part of western Odisha. Modern music has seriously affected the livelihood of the Baja troops, resulting in the gradual disappearance of this age-old traditional art form. In 2014, folk artists from western Odisha had staged a protest in front of the legislative assembly demanding the status of Adikala (primitive art) for Ganda Baja. On that occasion, they tried to foreground two issues: their strong attachment to their culture, and their earnings from their occupation. They vociferously argued that their culture was their occupation too, which is why there is an urgent need for the revival and promotion of Ganda Baja. Sujit Kumar Mishra (sujitkumar72@gmail.com) teaches economics at the Council for Social Development, Hyderabad.